A circle of friends embrace while swimming. Children groggily wake up in squalor on a dirty concrete floor. A young couple dances under the stars. These fleeting moments, collected by Wendy Ewald, are from This Place, Frédéric Brenner’s new exhibition that examines the land and people of Israel and the West Bank in its complexity. While photography is often thought of as two-dimensional, This Place portrays Israel and the West Bank’s land and people in a myriad of ways. Similar to a kaleidoscope, we see that clear understanding cannot be quickly captured because the images are fragmented and continually moving. Just when one thinks they have uncovered an understanding of the region, the lines shift, much like the changing boundaries within that ancient land. This Place is the visionary brainchild of Frédéric Brenner, a French photographer best known for Diaspora, his impressive 25-year quest to create a visual record of Jewish people across 40 countries. For This Place, Brenner knew he wanted to create a portrait of Israel and the West Bank that explores the highly contested location “as place and metaphor.” Instead of seeking to capture the diversity, paradoxes and the human condition himself, Brenner invited eleven acclaimed photographers, Wendy Ewald, Martin Kollar, Josef Koudelka, Jungjin Lee, Gilles Peress, Fazal Sheikh, Stephen Shore, Rosalind Fox Solomon, Thomas Struth, Jeff Wall and Nick Waplington to join him in Israel and the West Bank for residencies. The photographers came from diverse nationalities, cultures and religious traditions – even their ages spanned 50 years. A key to understanding the exhibition lies in Brenner’s challenge to his fellow photographers and to us. He asks, “Will we have the courage to question the narratives and the devouring myths that are the very anchor of our civilization?” To respond honestly to these issues, photographers had to unveil any biases they held and to then find the inner strength to photograph contentious issues without projecting bias – because it would have been instantly apparent in the photographs. As viewers, Brenner also calls on us to resist the easy way out: to see the full complexity without casting judgment on either side of the Israeli-Palestinian conflict. As time is spent with photographs, one notices how details, nuances, complexities and indeed, perplexities are revealed. While common themes are present throughout the photographs, such as identity, family and community, each photographer has a unique conceptual and stylistic approach: Fazal Sheikh’s aerial desert photographs are portraits of the land that reveal markings, icons and scars across the earth. Photographer Jeff Wall was struck when he found Bedouin olive pickers sleeping on the ground by a farm and a large prison – so much that he returned a year later to recreate the scene with the same people, photographing them every morning at dawn as they slept. Gilles Peress, known for his work in conflict zones, was the only photojournalist to participate. Peress captured the joy of life’s simple moments – a young girl playfully balances horizontally on wires, while an older man swings beyond the frame from a plastic chair suspended by rope. 85-year-old Rosalind Fox Solomon traveled by bus with commuter workers across Israel and the West Bank to connect with diverse religious communities, including Ghanaian pilgrims at the Mount of Olives, Jewish teenagers at Purim, and Christians at the Church of the Holy Sepulchre. Wendy Ewald, known for her work in participatory photography, expanded her project until she had worked with 14 groups of people, providing them with cameras and encouraging them to photograph themselves, their daily lives, and to share the Israel and the West Bank as they experience it. Cora Michaels described some of the communities that Ewald worked with, including Palestinian women elders in East Jerusalem, Druze students in the village of Julis, Jewish Israeli military academy students in Ein Gedi (Dead Sea), 6th grade Palestinian students in Hebron (West Bank) and Israeli high-tech workers in Tel Aviv. Some of the participants had never held cameras before – yet they found beautiful and thoughtful ways to visually communicate about their lives. The journey toward understanding oneself – and then others – is a lengthy one. Photographer Jungjin Lee walked for hours in search of the right place to photograph. She then printed her chosen images in ways that appear painterly and poetic, provoking us to question the reality of Israel that we see as truth. Within each frame of her large photographs, we find an opportunity to begin our own journey anew, to step beyond the boundaries we have created for ourselves when we judge other places. It’s an opportunity to see Israel, the West Bank and our own life in a new way. On Monday, our friend Michal Froman was attacked by a Palestinian teenager in the West Bank settlement of Tekoa. Thankfully, the pregnant Michal survived the stabbing, avoiding life-threatening injuries to herself and her unborn child. The recent violent attacks in Israel/Palestine have been extremely troubling, further indicating that the ongoing struggle for Middle East peace remains woefully out-of-reach due to self-serving politics. But yesterday’s attack hit close to home for me, Tanenbaum and our Network of Peacemakers from around the world. Ms. Froman is the daughter-in-law of the late Rabbi Menachem Froman, one of the first recipients of Tanenbaum’s Peacemakers in Action award. Rabbi Froman spent his life promoting reconciliation between Jewish settlers and Palestinian residents in the West Bank and Gaza. He envisioned a “humane state,” one in which all people — Jewish and Muslim, Israeli and Palestinian — treat each other with respect and dignity. Rabbi Froman’s work brought many people together, including political leaders, and he perceived the conflict as a tragedy of “two peoples loving the same land.” By seeking the common ground of having a shared faith in God, his work often transcended politics and motivated his own work on a deeply spiritual level. Rabbi Froman dedicated most of his life to promoting reconciliation between Jewish settlers and Palestinian residents in the West Bank and Gaza. So it was no surprise to hear the reports of Michal Froman recognizing her attacker’s humanity when describing the 15-year-old to police and the media. Her father-in-law surely would be proud and so are we. Today is a day filled with sorrow. As once again, our hearts are broken for the more than 120 innocents murdered across Paris. We ache for them, for their families and friends, and for their nation which is under siege. Today is a day when we stand in solidarity with the French people from all walks of life and diverse beliefs. In one voice, we denounce the violent extremists – apparently ISIS followers – who claim “credit” for butchering people just going about their lives in restaurants, concerts and as they moved across their city. We also mourn and draw attention to the over 40 Lebanese deliberately slaughtered only days ago – including Sh’ia Muslims, Christians and Druse – by two ISIS suicide bombers in Beirut. We remember in profound sorrow the Israelis and Palestinians – Jews, Christians and Muslims – who are dying amid a rapidly escalating cycle of condemnation, division and violence in their homeland. We recognize the Muslim and Christian Syrians who are desperately seeking to escape from the horrors that ISIS and others are inflicting on them in what was once a thriving nation. And we must not allow ourselves to forget Aylan Kurdi, the Syrian toddler who we all mourned, when he washed onto a beach as his family sought to escape the constant terror that Syrians now face. Today, with one voice, we must remember the horror of Paris and horrors across our globe. But we must do more. We must reaffirm our commitment to the core values in our many traditions and beliefs, and to our shared humanity. There are many possible responses to today’s horror in Paris. Sadness fills us. But this is also a time to recommit to one another. To standing together amid our many differences, to honoring our neighbors and joining with them to stand against the aberrant extremism that threatens us all. Let us stand together and, with strength, proclaim enough! Tanenbaum Peacemaker Yehezkel Landau met with Peacemaker Rev. Canon Andrew White yesterday morning in Jerusalem. They had a deep and important conversation over coffee inside the Jaffa Gate to the Old City. Andrew is in Israel to work on getting humanitarian relief to people in Gaza. They shared elements of their respective peace efforts, and are trying to support each other going forward. We are glad to hear that Andrew is doing well. Approximately 1,000 Palestinians have found shelter in a Greek Orthodox Church in Gaza that was built in the 12th century. “We have opened the church in order to help people. This is the duty of the church and we are doing all we can to help them,” Archbishop Alexios said to a Reuters reporter while the sounds of children playing echoed down the hall. “At the beginning there were 600 people and today they became a thousand – mostly children and women. Some of those children are a week old,” explained the head of Gaza’s Greek Orthodox minority. Gaza and Israel: Which side is Tanenbaum on? Many news agencies have reported on the sharp increase of anti-Semitism, although anti-Semitism has been on a slow rise over the past 25 years. Newsweek reported on July 24th that the foreign ministers of Italy, Germany and France have issued a joint statement condemning anti-Semitic statements and acts that have been witnessed throughout anti-Israel protests. President Obama issued an executive order that bans federal contractors from discriminating against Lesbian, Gay, Bisexual and Transgender (LGBT) employees. Obama first promised to issue the order during his 2008 presidential campaign. The order does not include any language that exempts religious organizations from following the discrimination protections. However, there is a possible loophole – Obama’s order adds LGBT protections to a previous order signed by President Lyndon Johnson. Johnson’s order does have an exception that allows religious groups to hire only employees “of a particular religion”. PBS reports on how medical doctors and spiritual practitioners are working together to address mental health in India. There is a dire need for help; in India, only five thousand psychiatrists serve the needs of 120 million people. It is estimated that one hundred million people in India have “common” mental health disorders while 20 million have severe illnesses, e.g. schizophrenia. Watch the video or read the transcript for more. As the Israel-Gaza violence escalates, I get more and more inquires about the organization I lead, asking where Tanenbaum stands and calling on us to speak out. In a number of ways, albeit not always directly, we have tried to say that we are torn apart by the violence on both sides. But that is not enough. It is time to try to clarify, though I know that many will not be satisfied because they want Tanenbaum and me to take a side. We do take a side – it is the side of life. And the pursuit of a more peaceful world where differences – including religious differences – can thrive. That means that Tanenbaum unequivocally condemns the use and abuse of religion in the furtherance of violence and geo-political aims. It means that we denounce the extremists on both sides, who fuel war, horrific violence and hate. It means that we oppose the verbal violence and rhetoric, the stereotypes and the “othering” that makes the human beings on both sides seem less human. It means that Tanenbaum abhors war and violence, and that our hearts ache for the victims on both sides. We are watching a human catastrophe for which words fail. Real people live in Israel and Gaza– people like you and me, who simply want to live their lives. Instead, they are being brutalized. We see the Palestinian mother who watched her child die from a bomb. And the Palestinian father who is unable to keep his family safe. They are real, and I cannot imagine their agony. So too, is the Israeli mother who buries her son. And the Jewish child in Israel, who knows that she is alive today, only because Hitler did not finish what he started. And who also knows that the constant rockets mean that some of her neighbors are dedicated to making sure Hitler’s plan for her is finally realized. These men, women and children – the real victims on both sides – are why Tanenbaum works to combat the abuse of religion and the violence. They are why we recommit ourselves to the pursuit of peace for all. This is where we stand. On the side of life. The death and devastation must stop. https://tanenbaum.org/wp-content/uploads/2018/11/TanenbaumLogos_CMYK-Long-Red-Copy-300x39.png 0 0 igor solaja https://tanenbaum.org/wp-content/uploads/2018/11/TanenbaumLogos_CMYK-Long-Red-Copy-300x39.png igor solaja2014-08-01 09:30:362014-08-14 11:41:05Gaza and Israel: Which Side is Tanenbaum on? Who’s watching the spiral of hate? For those of us who care about acknowledging the humanity in each person- these are dark days. The Middle East is in flames. Religious practices across Asia and Southeast Asia are being snuffed out – from Christians and Falun Gong practitioners in China to Rohingya Muslims in Buddhist majority Myanmar. 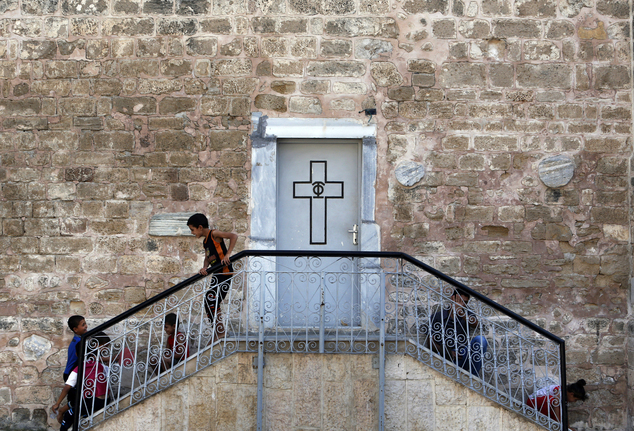 Christians are desperately fleeing their homes in northern Iraq. We object to this senseless hatred wherever it is found. And now, we see virulent anti-Semitism in Europe that horrifies us. If you’re watching, you can see the anti-Semitic anger cutting across Europe as protestors respond to the conflict in Israel and Gaza. While we would always support the right to peacefully protest and express one’s views on the tragedy that is the Middle East, we still have to ask – Why are so many of the current protests devolving into hate, violence and, specifically, targeting hatred toward Jewish people? At Tanenbaum, we condemn the violence that we see all around us – in the Middle East, in Africa and Asia. And that includes the violence that is threatening European communities, leaving many Jews fearing for their future. Frighteningly, what we are seeing in France and Germany is the tip of an iceberg. Data shows that anti-Semitism is a worldwide illness that has risen over the last 25 years. As we watch the news unfold, we must pay attention to the violence being perpetrated in the name of religion and as a form of hatred for individuals of particular traditions. In addition to headlines that make us all so sorrowful, we must also make it a point to witness the harm that is not reaching the headlines. And that includes attacks toward Jews just walking on the street to synagogues being set aflame. As we watch the spiral of hate seemingly spin out of control, we at Tanenbaum recommit ourselves to promoting and practicing respect – for all people. It’s time to end the spiral of violence. And we all have to be part of the solution. https://tanenbaum.org/wp-content/uploads/2018/11/TanenbaumLogos_CMYK-Long-Red-Copy-300x39.png 0 0 igor solaja https://tanenbaum.org/wp-content/uploads/2018/11/TanenbaumLogos_CMYK-Long-Red-Copy-300x39.png igor solaja2014-07-29 11:07:002014-08-14 11:39:14Who’s watching the spiral of hate? Before turning to the subject of this blog – the escalation of violence involving Israelis and Palestinians – I am painfully reminded that destructive and hate fueled violence is occurring in far too many places across our globe. So even as I focus on that flashpoint of the Middle East, I believe that we must simultaneously remember that every person experiencing war and violence is one of us. A human who is suffering. And a person who comes from a family and a community. That said, I want to share something we recently learned, in case it resonates with you. There is a small Muslim/Jewish movement from Israel/Palestine that is calling on people to dedicate the Jewish fast day of 17 Tamuz (July 15), which coincides this year with the Muslim holiday of Ramadan, as a day of prayer and reflection, focusing on stopping the horrible violence and bloodshed that is currently taking place in that land. We agree, but believe that this is a moment that people of all beliefs and none can share. A day of fasting, a day of committing ourselves to real solutions and an end to violence. מדובר ביוזמה משותפת של יהודים וערבים שתתקיים ב– 15 ביולי, יום שלישי הבא, לשביתת רעב משותפת בת יום,כנגד האלימות. בשעות אחה“צ יתקיימו אירועים משותפים ברחבי הארץ, של יהודים וערבים, חילונים ודתיים,פלסטינים וישראלים, של דיבור, לימוד ותפילה, ובסופם עם צאת הכוכבים יתקיים “איפטאר“- שבירת צום משותפת. ايام الصيام حسب التواريخ الاسلامية والعبرية تلتقي. فرصة لايقاف كل شيئ, في البيت, في العمل, في المجتمع, للاتحاد معا ضد سفك الدماء, ضد الانتقام وضد الخوف والانتقال لمحاسبةالنفس, لتحمل المسؤولية, لللتغيير والاصلاح, للاجتماع مع النفس ومع الغير, للتكلم معا وللصمت معا, لاختيار الحياة من جديد. الموضوع هو مشروع لقاء مشترك للعرب واليهود بتاريخ ١٥/٧ يوم الثلاثاء المقبل, لاضراب مشترك عن الطعام ليوم واحد ضد العنف.وفي ساعات ما بعد الظهيرة ستقام لقاءات مشتركه في انحاء البلاد, عرب ويهود, علمانيون ومتدينون, فلسطينيين واسرائيليين, للحوار,للتعلم وللصلاه, وفي النهايه مع ساعات المغرب يكون افطار جماعي لكسر الصيام. صيام وحساب للنفس ومشروع مشترك “نختار الحياة” في مناطق سكنكم. Days of fasting in the Jewish and Muslim calendar come together. An opportunity to pause. At home. At work. In the community. to a place of looking inwards, taking responsibility, and making a difference. To meeting myself and the other, to be still and to talk to one another. Another chance to choose life. A joint Arab and Jewish initiative that will take place on July 15th, next Tuesday, of a mutual hunger strike against violence. All over the country joint events will take place in the afternoon, of Jews and Arabs, secular and religious, Israelis and Palestinians, to talk, learn and pray. At the end of the events, when the stars come out, an Iftar will take place, a mutual breaking of the fast. We invite you to share, to fast, to look inwards and to initiate a “Choosing Life” event where you live. May we make a difference! Across the world, I join with the men and women who are horrified and profoundly saddened by the murder of three young men – Naftali Frenkel, Eyal Yifrach and Gilad Shaar. Across much of Western media, we have seen their smiling faces reflecting the energy of young lives full of hope. We have heard their names. In many cases, we have listened as mothers, aunts, relatives begged and prayed that the boys would return alive. But they did not. Instead, they were murdered, left alone under dirt and rocks. It is time that all people across the world – of all religions and political persuasions – condemn these killings especially because they appear to have been based on the boys’ Jewish identities and perhaps also their national one. We need to remember Naftali, Eyal and Gilad. But if we want to stop such senseless slaughters, we need to do more. We also need to remember the faceless others, who are also dying because of their religions and identities. In the last year, how many Syrian children lost their lives because they were on “the wrong side?” or from “the wrong Islamic tradition?” How many Muslim children have died recently in Myanmar? How many Coptic Christian children are being killed in Egypt? Together, we need to condemn the senseless bloodshed around the globe. With great sorrow I learned about the kidnapping and murders of three Israeli teens, Eyal Yifrach, Naftali Fraenkel, and Gilad Shaer. My heart remains heavy through this holiday weekend in the US as news has reached us that Muhammad Hussein Abu Khdeir, a Palestinian teen, was also kidnapped then burned to death near his Jerusalem home and that violence and fear has gripped the land. No mother should endure the torment of not knowing whether her child will be targeted or killed because of his or her religion or national identity. At Tanenbaum, we fear endless cycles of violence. We fear a society desensitized to bloodshed and the fate of our children. Each of us is responsible. And it is our responsibility to imagine what peace could bring and then find ways to support it. One way is to recognize and respect our diversity and to promote both nonviolence and inclusion.